On the Podium is a semi-regular feature in which we profile the racing accomplishments of CRCers. In this issue we touch base with Becky Hutchinson, our former club president and continually dedicated member. Becky races all distances from the 5k to the marathon; you’ve likely seen her at local races large and small. 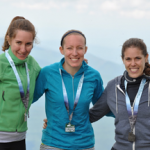 Recently, Becky ran up the largest mountain in the Eastern United States, in the Mt. Washington Road Race, helping the CRC women’s team finish in first place. 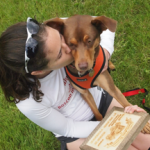 She also escorted her dog, Snuggs, to a first place finish in the “5k with Dog” division of the Pineland Farms Trail Running Festival in New Gloucester, ME. Racing with her dog has brought new meaning to Becky’s running career! The marathon – it was my first love and will probably never be trumped, despite setbacks. Because I didn’t run in high school or college, CRC introduced me to racing. And as you might expect, by the end of my very first long run with the club (12 miles, which was the longest I had ever run! ), the club had me convinced that I could do a marathon that fall. I was so inspired. Mt. Washington. It’s so unique and you can’t beat the feeling of accomplishment when you reach the summit. What is your best/favorite performance of your racing career? 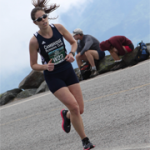 Running the inaugural Exeter Marathon (now Gansett Marathon), first organized in 2010 by race director Mike Tammaro, was the purest race experience of my running career. I toed the line with just 50 other competitors that day. Thanks to the conspicuous absence of spectacle and fanfare that now surrounds most events, I was able to listen to my body, find my zone, and hit my PR. It also helped to have my amazing friends and family following me down the course: I ran upon a personal cheer squad every few miles! This sounds like pandering, but my idols and role models are the members of CRC. They inspire me by their balanced dedication to running and dedication to work/family/life. I’m just as likely to hear about someone winning a race as I am to hear about another getting published, traveling the world, or making a breakthrough in the lab. I feel so lucky to be surrounded by interesting and truly talented people – they all inspire me. The long run. I love pushing a strong finish on an 18 or 20 miler, though I’m admittedly only able to do this when marathon training. I’ve been committed to Saucony for years now, following their transition to lighter weight minimal shoes like the Kinvaras and Fast Twitch. But I’ve also recently introduced Vibram 5-Fingers into my weekly mileage and am really enjoying the variety they provide. I’m trying to focus on a shorter quicker stride and the “barefoot running” is helping me make the necessary structural changes. Can you tell me a little about your past year in racing? Some interesting firsts or fun things that you’ve participated in? One word: Snuggs. Snuggs is my dog and she has refreshed my approach to running and training. Snuggs has proven to be a natural runner and a fierce competitor, and running with her reminds me let go of the metrics of time, pace, and distance and just enjoy being outside and going fast! How long have you been racing? What made you want to be a runner? awww, hi snuggs! He’s awesome.